HARRISBURG, Pa. – November 12, 2012 –Gotta Pea, a fresh start-up entertainment brand with a (literally) green and eco-friendly message, has taken the wrapping off of some new uniquely pea-riffic holiday items just in time for last-minute shopping. 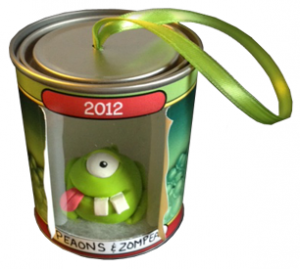 A first look at their hand-sculpted and personalized ‘Pea in a Can’ ornaments and quirky greeting cards can be found on Gotta Pea’s “Happea Holidays!” Kickstarter page at www.kickstarter.com/projects/gottapea/gotta-pea-happea-holidays. To learn more about Gotta Pea and the junkyard world of Peaopolis, visit the official website at gottapea.com/. Founded in 2008, Gotta Pea® is a quirky company with an eye on the environment, a pea-riffic line of mobile and social online games, and Peaopolis at the center of their universe, Gotta Pea® creates fun products for the whole family. Gotta Pea® games are addictively entertaining and Gotta Pea® characters are a pod-full of personality, building buzz for environmental issues across interactive digital divides. Meet them all at http://www.gottapea.com and help spread “Peas on Earth” this holiday season.